Are you ready to take your ping pong game to the next level? Do you find yourself wishing you won more games against your friends or coworkers? I can relate because I’ve been playing ping pong for nearly thirty years. Early on my game steadily improved but after a while it plateaued and I didn’t seem to be getting any better. That’s when I found out how important ping pong strategy really is. Sure, we all want a powerful forehand, a wicked backhand and want to win all the matches against our buddies but; that’s not real ping pong strategy. What is Ping Pong Strategy? Well at it’s core, ping pong strategy starts with you because it’s different for every player. 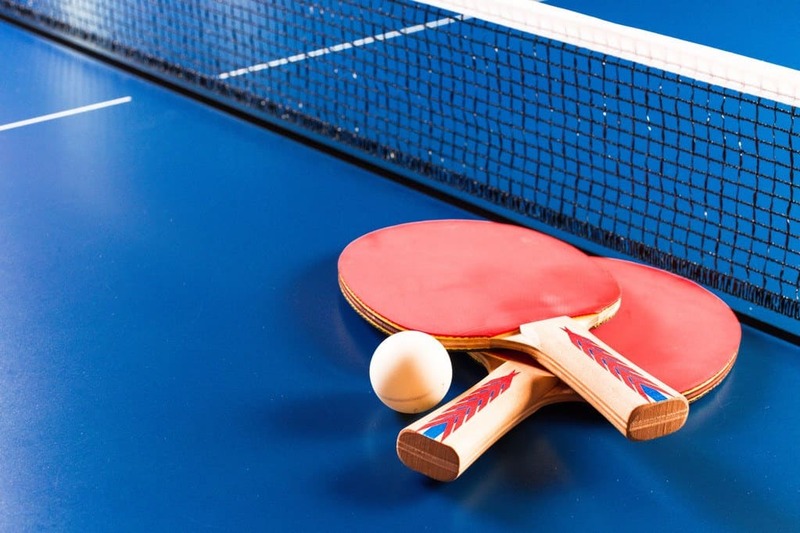 Ping pong strategy is rooted in knowing the nuances of your game, maximizing your strengths but also recognizing your weaknesses and not letting your opponent take advantage of them. In essence, good ping pong strategy hides your deficiencies from your opponent and sets you up to win by playing to your strengths. So, I began to look into ping pong strategies that could help take my ping pong game to the next level and propel me onto a path of development. I quickly realized the difference between a recreational player and a serious tournament ready player is strategy and finesse. But you might be surprised to find that some of the best ping pong strategies are more basic than you think. Here are a few key ping pong strategies to master–and how they can help you get an edge on your opponent. If you want to master ping pong strategy, the best place to start is the basics. As with any sport, even the toughest opponents can be beaten by mastering basic techniques. Here are a few components of your game to focus on. To begin, take a look at the start of any round. Your serve. A serve is integral to any table tennis game. And if you’re not thinking of your serve as a tool to get an edge on your opponent, it’s time to change your thinking. A serve is your first chance to set the tone for a point–it could even win you the point if you play it right! You can throw off your opponent, play to their weaknesses, and set a pace that makes it hard for them to regain an advantage. What Makes a Good Serve? With that in mind, let’s take a closer look at what makes a good serve. The placement of the ball is obvious, if tricky to master–the best ball placement depends primarily on your opponent. Different opponents stand at different distances in preparation for a serve, and your ball placement should take this into account. However, deception is a little harder to pin down. For example, players may use a serve that looks similar to another serve but creates a different type of spin, leading their opponent to react in a way that the server can use to attack. There’s also the amount of spin–clever players will trick their opponents into thinking that there’s more or less spin than there actually is, leading their opponent to hit the ball into the net. But the placement of the ball can also be used as an element of deception. Players might place the ball in one place and change at the last second, leaving their opponent unprepared and scrambling. This is usually done by turning the paddle a fraction to change the direction of the ball. Whatever you prefer to do with your serve, make sure to practice often and change up your techniques–tricking your opponent with the same ploy only works one or two times. After you’ve gotten a handle on serving, the next thing you need to master is your spin or more specifically, your opponent’s spin. Spin is a fun way to change the progress of a game, and an interesting trick of physics. It makes a ping pong ball move in ways that seem to be impossible (but are exactly what you need to get a point). The first step is knowing what kind of spin is being put on the ball. The easiest way for new players to figure this out is by looking at your opponent’s racket–specifically, the angle of the racket when he or she makes contact with the ball. Not sure what those kinda of spins are? A topspin will create a ball that seems drawn to the table like iron to a magnet. A backspin can make the ball slide back or even off the table like a hockey puck on ice. And sidespin (when it isn’t properly countered), will make the ball ricochet off your opponent’s racket at angles that would give your geometry teacher fits. When you’ve mastered even simple spin techniques, the world of ping pong becomes a lot more fun! The more control you have over the ball, specifically around putting english on the ball, the more control you’ll have over your opponent and the point. One of the easiest ways to get a point in ping pong is to make your opponent hit the ball into the net. This can often be accomplished with heavy backspin. If you’re playing with purely recreational players, you’ll see the points begin to rack up in your favor because a less experienced player doesn’t know how to counter spin and keep the ball from falling dead into the net. More seasoned players will recognize this and put their own counter spin on the ball to neutralize your shot. This forces the action into a game of “who can out manipulate the ball more” where the player with supreme spin technique will more often than not, win the point. As you improve and are able to execute more advanced shots, your overall ping pong strategy will shift somewhat to a more “counter” oriented style of play. Of course, it’s not enough to be able to recognize spin from your opponent’s racket. You also have to know how to react. For that, again, you need to use the angle of your racket. This will take some practice, and generating spin will be inordinately difficult with a cheap racket. So if you plan on playing regularly or with any degree of seriousness, it’s worth it to invest in a good paddle (or make your own). Another key component to basic ping pong strategy is knowing your strokes. Serving and and in game power strokes are two techniques that are critical to the game and will always reward further practice, even if you’ve been playing for years. There are other types of strokes you can use, but these four are a great place for any beginner to start. Let’s break them down. Let’s begin with your stance. Your feet should be wider than shoulder width, and your dominant foot should be slightly further back than your nondominant foot. Your knees should be bent and your weight should be on the balls of your feet–this makes it easier to move quickly. During your backswing (the first movement after you see the ball), the most important thing is to remember to rotate your body starting with your hips and let that movement travel up the rest of your body through your swing–otherwise, your swing will lack power. Next comes the fun part. The strike. Rotate your body forward from the hips, transferring weight from your back foot to your front foot. Keep your racket angle slightly closed and accelerate your forearm slightly as you make contact. Then, there’s the finish. Unlike tennis, you don’t want to end up with your paddle over your shoulder or across your neck. Don’t over-rotate. Instead, finish with your paddle pointing where you hit the ball, moving forward and up after your strike. The backhand drive is a little harder to master than the forehand drive, if only because it’s harder for many players to control their motion in a backhand swing (they may have also learned bad habits from other racket sports). To start, take a look at your stance. You should be square with the line of play (facing the table and your opponent). Your feet will often point diagonally to your opponent’s backhand corner. Otherwise, the stance is the same. Unlike forehand, the backhand backswing doesn’t require any rotation–just bring your paddle in closer to your body. To strike, move your paddle forwards and up from the elbow towards the ball. Remember: elbow movement, not wrist or shoulder. The finish is the same as the forehand drive – the racket should follow and point in the direction of the ball you just hit. Now, let’s change things up a bit and look at your forehand push. The stance is the same as what you used for your forehand drive. The backswing isn’t nearly as extreme as the drive–you will need a small amount of twisting, but this shot is softer and demands more feel than power. You’ll also need an open racket–45 degrees will serve you well. The strike does require you to twist and transfer weight (slightly) from your back foot to your front foot. As the name implies, you’re going to push your racket forward and down from the elbow, brushing the ball with the rubber instead of striking it with the blade of your racket. The finish should leave your paddle in front of your body, facing in the direction of the ball. You’ll be tempted to swipe the ball across your body–resist the urge and follow it instead. Finally, there’s the backhand push, which is easier than the forehand push. The stance is exactly the same as your backhand drive. The backswing, however, is different. It requires that you bring the paddle backward and slightly upward toward your chest. The strike, much like the forehand push, isn’t really a strike so much as a push. Don’t tap the ball–brush it. Don’t scoop the ball either. Your racket angle should stay open throughout. Your finish should leave the paddle in front of you and angled towards the table. Your elbow angle should have opened, but your arm should still be bent. Again, resist the temptation to swipe the ball across your body. Think you’ve got the basics down to a science? Great! Let’s talk about your gear. A great paddle won’t save you if your technique is poor, but it can help you execute certain techniques more effectively. Conversely, it doesn’t matter whether you’re using the Killerspin Jet 800 or the Stiga Titan. What’s more important is that you choose the gear that works for you and stick to that gear alone. If you regularly switch paddles, you’ll constantly have to readjust your style of play to work with the paddle, and it will be difficult to execute a real strategy. However, be careful not to get too much paddle on the first try. If you’re making the transition from a basic recreational paddle to a serious paddle, work with a coach to learn how to properly use it. Now, we’ve spoken quite a lot about you. But remember: ping pong is a two-person sport. Whatever else you do, don’t forget to keep an eye on your opponent. Your opponent is trying to win just as much as you are, so don’t assume that they’re always going to stick with the same old play. Be prepared to react if they decide to take a gamble, and learn how to read their body language to anticipate a gamble as best you can. Perhaps the best ping pong strategy of all? When you practice, show up with a plan. You should know what your weaknesses are and what you’re going to focus on in a given practice. Ideally, you should show up with some drills in mind. Finally, a strategy that works in tennis also works here: stop changing your strategy. That might seem counterintuitive, given everything that we just told you. Here’s the thing: a beginner player changes their ping pong strategy at random, without a plan or full consideration of their opponent or the game at hand. An expert knows what their best strategies are and how to apply them to an opponent–and they know what strategies to break out in an emergency. Ready to Master Your Ping Pong Strategy? Are you ready to take your ping pong strategy to the next level? We offer comprehensive buyer’s guides and strategy tips so that you can take your game up a notch. If you’re looking to upgrade, check out our buyer’s guides. And if you have a ping pong question we haven’t answered yet, don’t be afraid to get in touch and let us know!